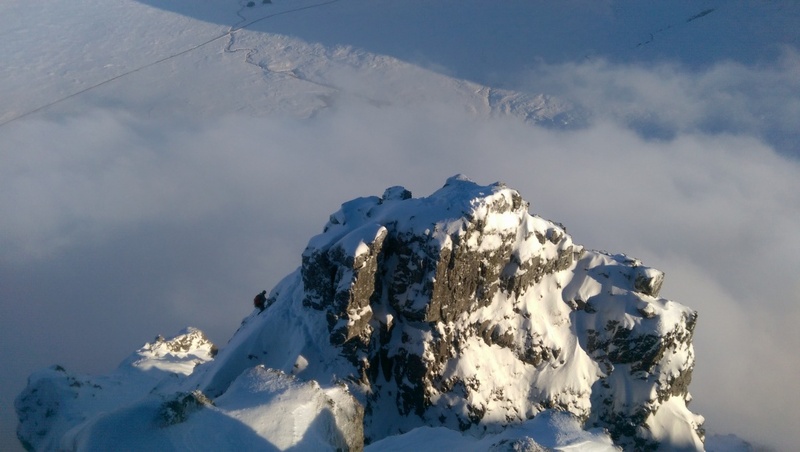 In the first of a series of articles about the finest Scottish winter routes, Jöttnar's Mike Pescod guides us through Curved Ridge on Buachaille Etive Mor, Glen Coe. The first winter climb of the season always feels like a real test. 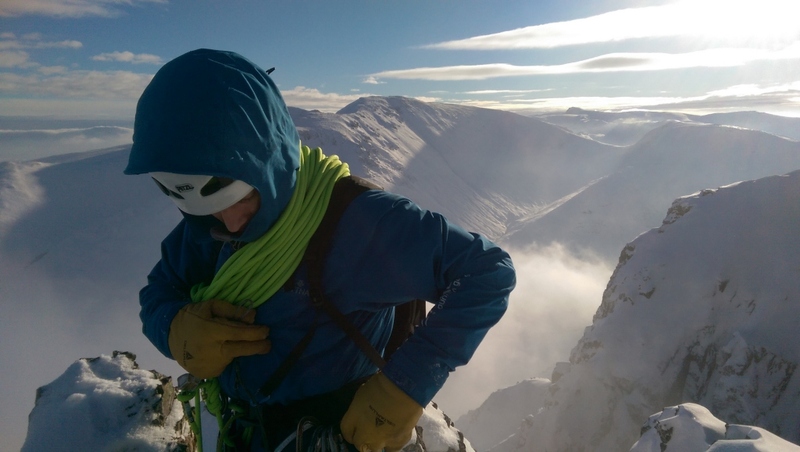 It takes a climb or two to work through the faff factor of fumbling with gloves on, to remind yourself which way up your crampons go, that you need to pee before you put your harness on and that you need to eat constantly. When you throw in short days, a thin cover of fresh, useless snow and a chance the ground is not yet well frozen, it’s not surprising that it feels tough to get going. So, try Curved Ridge on Buachaille Etive Mor as a wee warm up climb. It’s a beautiful route at grade II or III depending on the conditions on the day with some very nice climbing. It’s a long route so you will get lots of time in your crampons but it is a relatively short day. The walk in is less than an hour and the climb goes all the way to the summit of Stob Dearg with a short enough walk down Coire na Tullach at the end of the day. The climbing is always interesting, varied and on solid rock with plenty of spikes for protection. Much of it can be climbed like an Alpine ridge by shortening the rope and moving together. The crux sections are quite easily seen and it’s worth throwing in a couple of pitches on these. A magnificent route and by far the most popular to the summit of the mountain. It passes through grand rock scenery, is a good general viewpoint and gives interesting climbing under almost any conditions (especially well sheltered from a SW gale). Certainly the most useful winter climb on the Buachaille and can be quite hard. The line follows the crest of the ridge throughout. Easier options are available in the gully to the right of the crest (beware of avalanches). Climb slightly left out of the Crowberry Basin by any of the several variations and pass beneath the Rannoch Wall of Crowberry Ridge (two short steep pitches) to reach a final big cairn at the top of Curved Ridge proper and below the foot of Crowberry Tower. From the cairn a horizontal left traverse for about 30m brings one onto a snow slope with two gully exits. 1 The gully slanting back to the right reaches the Crowberry Tower Gap and from there a short groove leads left then right to the top of Crowberry Gully and the final summit slopes. 2 The gully going up slightly leftward leads directly to the summit rocks. It is probably the quickest but not the most interesting way. If time permits, an ascent of the Crowberry Tower can be included if the first route is followed. From the gap a short corner is climbed to a ledge on the left, then an easy rising spiral traverse leads to the top. There are more interesting routes up the tower, but this is the easiest and best in descent.